And it’s out! 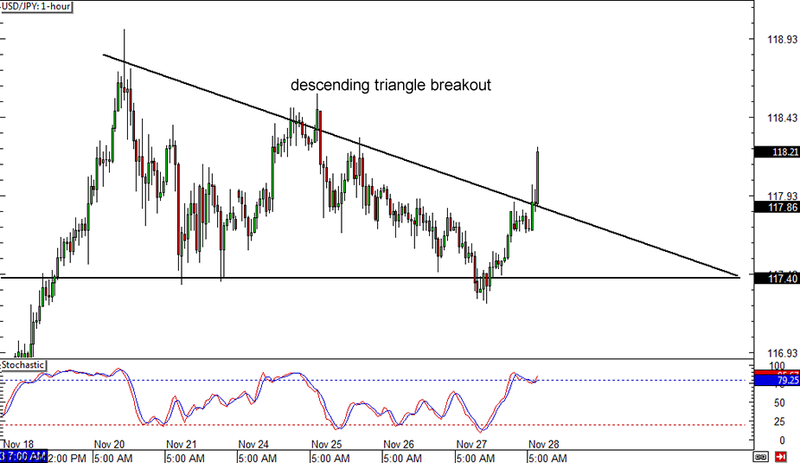 After weeks of consolidating inside a descending triangle forex pattern, USD/JPY finally made a break for it and surged past the resistance. This could mean that more gains are in the cards for the pair, although stochastic is already in the overbought area and suggesting that a pullback might be likely. If USD/JPY is able to carry on with its climb, it could go up by as much as 150 pips, which is the same height as the chart pattern. If you think you’re too late to catch the move, make sure you review our lesson on How to Trade Triangles to see how you can still profit from this. Here’s another potential rally for a dollar pair, as USD/CAD also made an upside breakout recently. 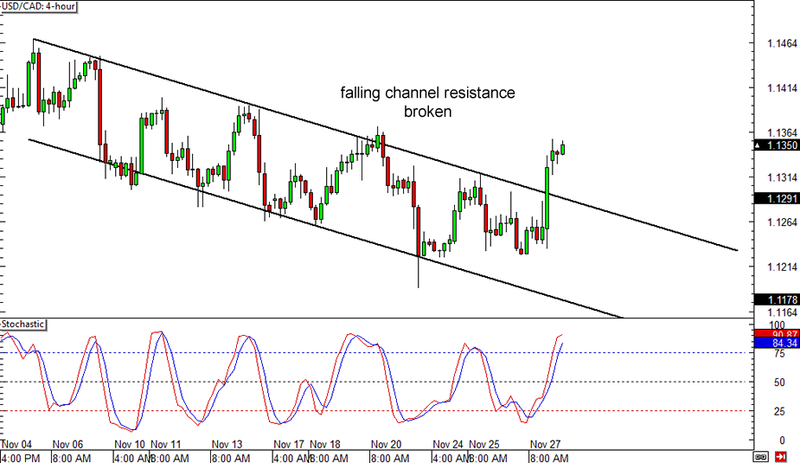 The falling channel resistance already gave way, suggesting that the downtrend is about to turn. In fact, a double bottom chart pattern can also be seen, with price moving past the neckline around the 1.1300 major psychological handle and confirming the reversal. With that, USD/CAD could make its way back up to its recent highs around the 1.1400 mark and beyond. Take note that stochastic is already in the overbought area though, which means that a retest of the broken channel resistance is still possible before the pair resumes its climb. Geronimo! 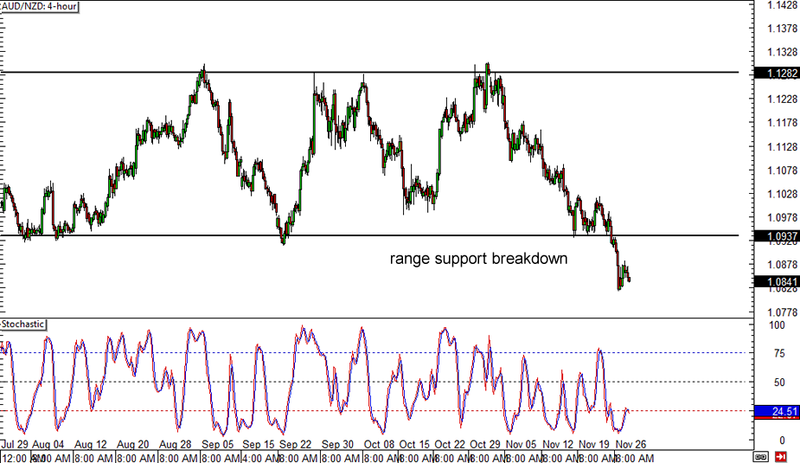 AUD/NZD could be in for a huge drop, as price broke below the bottom of the range on its 4-hour forex chart. Support around the 1.0940 level was breached earlier in the week, indicating that the pair is headed further south. Stochastic is reflecting a pickup in buying pressure though, which might lead to a quick retest of the broken support area before AUD/NZD breaks below its previous lows. If this proves to be a fakeout, however, price could still have a shot at moving back inside the range and even testing the resistance at 1.1300. Swing by our lesson on Avoiding Fakeouts if you think this is the case!